Clear calls, easy-to-use but still elaborate video conferencing functions and webinar tools. ReadyTalk is the catch-all for business conferencing needs. I use the teleconference function primarily but webinar functions are effective, current, and easy-to-use. Customer service is immaculate. Clear calls, easy-to-use but still elaborate video conferencing functions and webinar tools. ReadyTalk is the catch-all for business conferencing needs. I use the teleconference function primarily but webinar functions are effective, current, and easy-to-use. Customer service is immaculate. My last company used ReadyTalk as our conference calling software, and it was mostly an okay system. It was a little higher learning curve than other calling software I have used and the interface could use an update, but the customer support team was always great and willing to come out to the office and do training or update us on new features. My last company used ReadyTalk as our conference calling software, and it was mostly an okay system. It was a little higher learning curve than other calling software I have used and the interface could use an update, but the customer support team was always great and willing to come out to the office and do training or update us on new features. Simple to set up and easy to use. Too slow to load the media files. The most feature that I love when using this soft is the Outlook plug-in so that I never miss any invites. It’s also very easy to launch your meeting via the plug-in. Simple to set up. But it may be your nightmare if there are a lot of graphics and videos. Too slow to load the media files. The most feature that I love when using this soft is the Outlook plug-in so that I never miss any invites. It’s also very easy to launch your meeting via the plug-in. Simple to set up. But it may be your nightmare if there are a lot of graphics and videos. Clean interface For newbies it can be had to determine join in options. It was straight forward for users that have used similar conferencing tools. But for new users with the big green Call Me and Join meeting button it can be confusing if they do not have a 10-digit phone number and just a 4 digit extension in a conference room. The call in and join meeting links are hidden in comparison to the green Call Me and Join button. For newbies it can be had to determine join in options. It was straight forward for users that have used similar conferencing tools. But for new users with the big green Call Me and Join meeting button it can be confusing if they do not have a 10-digit phone number and just a 4 digit extension in a conference room. The call in and join meeting links are hidden in comparison to the green Call Me and Join button. I was handed ReadyTalk as someone else transitioned off our team and purchased it. I have been extremely disappointed with ReadyTalk compared to our old system, GoToWebinar. We use Hubspot and I spend 30 minutes or more setting up the integration and emails each time, where as with GotoWebinar, it was just a click of a button. They don’t allow for recurring meetings which is insane. We can’t use ReadyTalk for our weekly live trainings, so we have had to switch our entire training model. I am really disappointed with the user interface as well, it feels like it was written in a programming class in the 90s. We pay just as much for ReadyTalk as we did for GoToWebinar and GTW is a vastly superior product. I don’t like the operator assisted features, and I was told by the person who trained us that this is our only option if we have a lot of attendees. GTW was very simple, you just pick whether you want to dial in or use your computer audio. No attendees ever had any difficulty understanding, where as in ReadyTalk, we have lots of sound complaints. They also charge you if you leave recordings on their server and do not delete them. I find this pretty obnoxious. More customized registration options that allows for more branded look and feel More robust integration with hubspot, brings over a lot of information Ability to add in a quick survey post-webinar No webinar software is very good in my opinion, but steer clear of ReadyTalk. I would go for GTW even though they have their own quirks and issues. I was handed ReadyTalk as someone else transitioned off our team and purchased it. I have been extremely disappointed with ReadyTalk compared to our old system, GoToWebinar. 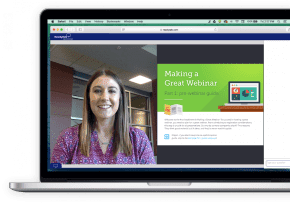 We use Hubspot and I spend 30 minutes or more setting up the integration and emails each time, where as with GotoWebinar, it was just a click of a button. They don’t allow for recurring meetings which is insane. We can’t use ReadyTalk for our weekly live trainings, so we have had to switch our entire training model. I am really disappointed with the user interface as well, it feels like it was written in a programming class in the 90s. We pay just as much for ReadyTalk as we did for GoToWebinar and GTW is a vastly superior product. I don’t like the operator assisted features, and I was told by the person who trained us that this is our only option if we have a lot of attendees. GTW was very simple, you just pick whether you want to dial in or use your computer audio. No attendees ever had any difficulty understanding, where as in ReadyTalk, we have lots of sound complaints. They also charge you if you leave recordings on their server and do not delete them. I find this pretty obnoxious. 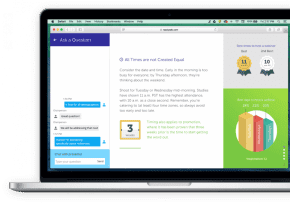 No webinar software is very good in my opinion, but steer clear of ReadyTalk. I would go for GTW even though they have their own quirks and issues. ReadyTalk provides video and audio web conferencing services that are simple and easy to use. Online meetings both large and small can take advantage of online collaboration tools, crystal-clear audio, and user-friendly interfaces. ReadyTalk has been recognized many times by Colorado media, including being named the best place to work in Colorado by ColoradoBiz Magazine. Web Meeting Pro 25, $49/mo, $39/mo annual: 25 web participants, 4 simultaneous feeds, unlimited VoIP, video conferencing, 1,000 toll/toll free minutes. 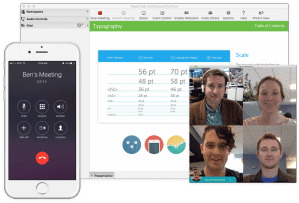 Mac, PC, Linux, iOS; Android is compatible for playback of previously recorded meetings but not for joining live conferences. Salesforce.com, Orackle Eloqua, Hubspot, Marketo, ExactTarger, Kapost, PR Newswire, Google Calendar, Microsoft Lync, Microsoft Outlook. Web Meeting Pro 150, $99/mo, $79/mo annual: 150 web participants, 4 simultaneous feeds, unlimited VoIP, video conferencing, 2,500 toll/toll free minutes. Webinar 150, $149/mo, $119/mo annual: 150 web participants, unlimited webinars, marketing integrations, 150 application sharing participants. Webinar 500, $399/mo, $319/mo annual: 500 web participants, unlimited webinars, marketing integrations, 500 application sharing participants. Webinar 3000, $499/mo, $399/mo annual: 3000 web participants, unlimited webinars, marketing integrations, 1,200 application sharing participants. Gold Level Webinar (1-time), $1,250: 100 participants, 60 minutes, Up to 3,000 Web Participants, Broadcast Audio, Operator Assisted, Audio, Simulive, Event Services. ColoradoBiz Magazine, Colorado’s best companies to work for, 2009; Deloitte Fast 500, 2007-2010; Ernst & Young Entrepreneur of the Year, 2008; Colorado Technology Association (CSIA) ranked as one of the top three companies of the year, 2010; Finalist, Denver Business Journal, Best Places to Work, 2010. Phone support 24/7 for US and international customers. What Do You Think of ReadyTalk?